"RADIOACTIVE" is stenciled on Abrams tanks in these pictures taken Oct. 13, 2005, in Topeka, Kansas. Across the plains of Kansas, destroyed, radioactive Abrams tanks, perched on railroad flatcars, rolled towards an uncertain future. Only one thing was certain. They would be radioactive forever. This would be their everlasting death mask. The Pentagon deceptively calls it "depleted uranium." The Abrams tanks are constructed with a layer of radioactive uranium metal plates. The big tanks fire a giant uranium dart at 2,100 mph, much faster than an F-16 fighter aircraft, mach III to airplane pilots and very, very fast to the rest of us. 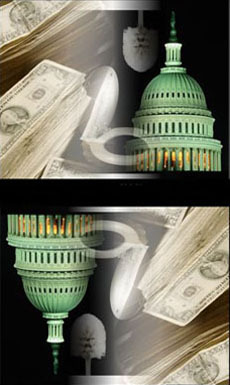 American taxpayers paid to ship the tanks to Iraq and to return them for disposal or re-building in the United States. The tanks are 12 feet wide and weigh a stout 70 tons, or 140,000 pounds. The enduring vigorous stupidity of the U.S. military pretends that radiation is one of those things that if you can't see it, it can't hurt you. They are thoroughly delusional, of course. A National Academy of Sciences report released June 30, 2005, finds that there is no safe level of radiation. Any radiation is bad. This radioactive tank sitting exposed on a flatbed railroad car in Topeka, Kansas, should have been "encapsulated," according to U.S. Army Regulation 700-48, which has the force of law. From America to Iraq and back, these giant radioactive hulks can only sicken and kill Americans. On top of the sheer, unrelenting stupidity of playing with radiation with unsuspecting soldiers, now the neo-con government is involving everyday Americans in their radiation madness. The Pentagon can't even follow simple radiation hazard mitigation instructions. Their own rules and regulations have the force of law throughout the world. Yet they are ignored in the United States. Dr. Doug Rokke is the Pentagon's former director of the U.S. Army Depleted Uranium Project. When contacted on Oct. 22, he viewed Chris Bayruh's photographs and made this statement about the radioactive tanks in Kansas: "The radioactive damaged Abrams tanks that were left unsecured on a Kansas railroad track are a perfect example of exactly how not to ship damaged radioactive equipment and how not to protect our Army's Abrams tanks from possible sabotage and compromise of classified battle systems." On Oct. 10, prior to the discovery of the radioactive tanks, Dr. Rokke made the following statement. It is eerily predictive of what would happen in Kansas three days later. "U.S. Department of Defense officials continue to deny that there are any adverse health and environmental effects as a consequence of the manufacture, testing and/or use of uranium munitions to avoid liability for the willful and illegal dispersal of a radioactive toxic material - depleted uranium." This is another of the destroyed radioactive tanks in Topeka, Kansas. Children were playing around the tanks. 1) Military personnel must 'identify, segregate, isolate, secure and label all RCE' (radiologically contaminated equipment). "The past and current use of uranium weapons, the release of radioactive components in destroyed U.S. and foreign military equipment, and releases of industrial, medical and research facility radioactive materials have resulted in unacceptable exposures." Dr. Rokke added, "Therefore, decontamination must be completed as required by U.S. Army Regulation 700-48 and should include releases of all radioactive materials resulting from military operations. "The extent of adverse health and environmental effects of uranium weapons contamination is not limited to combat zones but includes facilities and sites where uranium weapons were manufactured or tested, including Vieques, Puerto Rico, Colonie, New York, and Jefferson Proving Grounds, Indiana. "Therefore, medical care must be provided by the United States Department of Defense officials to all individuals affected by the manufacturing, testing and/or use of uranium munitions. Thorough environmental remediation also must be completed without further delay. "I am amazed," exclaimed Dr. Rokke, "that 14 years after I was asked to clean up the initial DU mess from Gulf War I and almost 10 years since I finished the depleted uranium project, United States Department of Defense officials and many others still attempt to justify uranium munitions use while ignoring mandatory requirements. "But beyond the ignored mandatory actions, the willful dispersal of tons of solid radioactive and chemically toxic waste in the form of uranium munitions just does not even pass the common sense test. "Finally, continued compliance with the infamous March 1991 Los Alamos Memorandum (see Note 5) that was issued to ensure continued use of uranium munitions cannot be justified. "In conclusion," Dr. Rokke urged, "the president of the United States, George W. Bush, and the prime minister of Great Britain, Tony Blair, must acknowledge and accept responsibility for willful use of illegal uranium munitions - their own "dirty bombs" - resulting in adverse health and environmental effects." 4) and ban the future use of depleted uranium munitions," Dr. Rokke concluded. Leuren Moret is a world famous scientist and radiation specialist who formerly worked at the Lawrence Livermore Nuclear Weapons Lab, where she became a whistleblower in 1991. She has spoken out about the danger of uranium munitions to humanity in more than 42 countries. Moret has appeared in four documentaries about uranium munitions (depleted uranium). "Beyond Treason" debuted in August 2005 and won the Grand Festival Award at the Berkeley Film Festival. The newest film, "Blowin' in the Wind," was nominated during its debut the first week of November in Australia for an Academy Award. "Sally Devlin, a little old lady in tennis shoes, went to a public meeting several years ago, held by the Air Force in Pahrump, Nevada. Two officers told the citizens of the town that the Air Force would be moving 80 old target practice tanks and tons of old depleted uranium munitions through their town. "The radioactive bullets had been picked up off the Nellis gunnery ranges by order of the state of Nevada and were being transported to the Nevada Test Site [a nuclear weapons test site] to be buried as radioactive waste. "When Mrs. Devlin politely asked them how they would prevent the residents of the town from being contaminated by the radioactive dust on the tanks and bullets, the officers said, 'We're wrapping them in Saran Wrap.' She told them that would be unacceptable and stopped the Air Force dead in their tracks," Moret concluded. Whether it is Saran Wrap in Nevada or nothing at all in Kansas, the Pentagon just doesn't get it when it comes to uranium radiation dispersing weapons. It is way past time to take all their nuclear weapons and uranium munitions away from them and send them home to get real jobs. They are clearly incapable of protecting this country from all dangers, including those created by our own U.S. military. The U.S. military shows so little regard for Americans in Kansas, one wonders what on earth they have done to Iraq. The U.S. military has distributed an estimated 8 million pounds of weaponized ceramic uranium oxide gas, aerosols and dust on a practically defenseless little country of 26 million people (see Note 6), according to an estimate by former U.S. Attorney General Ramsey Clark. What is this lethal radioactive weapon supposed to do? Why was it used? Ceramic uranium oxide gas is a genocidal weapon, for God's sake. It persists in the environment forever. In Leuren Moret's pithy words, "The Iraqis are uranium meat." The politicians, Pentagon staff, generals, commanding officers and others responsible for this war crime must be arrested, tried, convicted and appropriately punished for their crimes against humanity. Another explanation is that the U.S. Army and other branches of the military are far from stupid. They are, in fact, the most lethal and carefully planned military in the history of the world. The extensive use of weaponized uranium oxide gas, aerosols and dust is not an accident or an oversight. They did it on purpose. If this is true, they purposely used a genocidal weapon over at least a 15-year period. No, this is not a callous mistake of empire; it is a calculated act of genocide to weaken the oil- and gas-rich countries of Central Asia, including Iraq. Take your choice: they are either stupid or genocidal monsters. A British group has estimated the weaponized ceramic uranium oxide will account for an additional 25 million cancers in Iraq in the next several years. There are only 26 million Iraqis to start with, minus the nearly 1.7 million killed by war or sanctions since 1991, plus some live births. A National Academy of Sciences report released June 30, 2005, finds that there is no safe level of radiation. The committee dismissed the idea that any radiation could be harmless or beneficial. The radioactive tanks in Kansas and Iraq are the same. They are placed there at great expense by the senior American political and military leadership, with premeditated malice. The bottom line purpose of a 140,000-pound radioactive tank is to kill people. Dennis Kyne, noted speaker and writer, is a former drill instructor (DI) and a 15-year veteran of the Army as well as a Gulf War vet (see www.denniskyne.com). Kyne makes a point of how "hot" or radioactive the tanks in Kansas would be if they were hit by "friendly fire" to get beat up so much. They could be contaminated with as much as 30,000 times background radiation. That is what uranium munitions do to a tank, bunker or building. 1. Weapons may only be used against legal enemy military targets and must not have an adverse effect elsewhere (the territorial rule). 2. Weapons can only be used for the duration of an armed conflict and must not be used or continue to act afterwards (the temporal rule). 4. Weapons may not have an unduly negative effect on the natural environment (the "environmental" rule). "DU weaponry fails all four tests," Parker states. "First, DU cannot be limited to legal military targets. Second, it cannot be 'turned off' when the war is over but keeps killing. "Third, DU can kill through painful conditions such as cancers and organ damage and can also cause birth defects, such as facial deformities and missing limbs. Lastly, DU cannot be used without unduly damaging the natural environment. "In my view, use of DU weaponry violates the grave breach provisions of the Geneva Conventions," Parker concluded, "and so its use constitutes a war crime, or crime against humanity." 1. "Medical Management of Unusual Depleted Uranium Casualties," DOD, Pentagon, 10/14/93, "Medical Management of Army Personnel Exposed to Depleted Uranium (DU)," Headquarters, U.S. Army Medical Command, 4/29/04, and section 2-5 of AR 700-48 . 3. Section 2-4 of United States Army Regulation 700-48 dated Sept. 16, 2002, specifies these requirements. 4. IAW Technical Bulletin 9-1300-278, DA PAM 700-48. Maximum exposure limits are specified in Appendix F.
© Copyright Bob Nichols. Copying permitted if you credit the source and leave everything intact, including notes. Bob Nichols is a Project Censored Award winner and lives in California. He formerly lived in Oklahoma. He is a contributor to OnLineJournal.com, AxisofLogic.com, DissidentVoice.com and other online publications and is a correspondent for the San Francisco Bay View newspaper. Nichols is a former employee of the McAlester Army Ammunition Plant. He can be reached by email at bob.bobnichols@gmail.com.